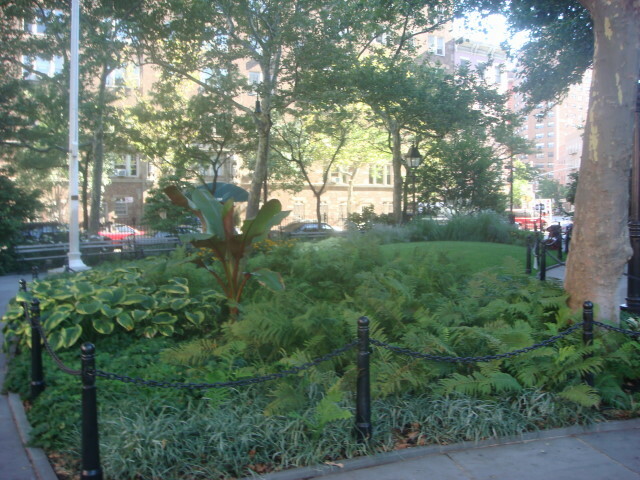 Somewhere in Greenwich Village…okay, at the corner of 12th Street and 8th Avenue…is Abingdon Square Park. 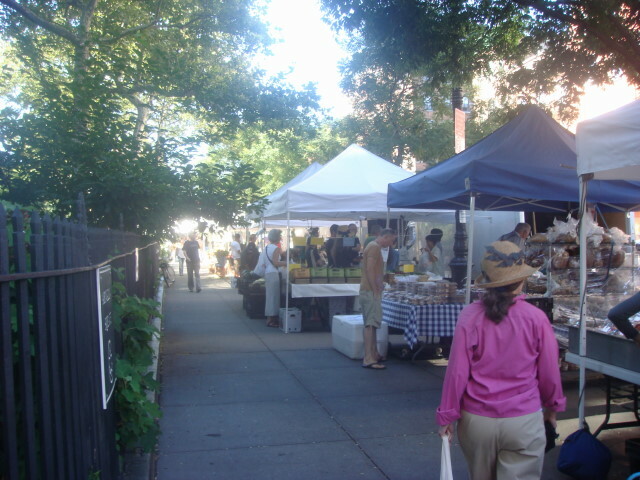 It’s pretty nondescript, but is graced with a Farmers’ Market every Saturday. I’ve been by there a few times and the place is pretty traditional for NYC parks. It’s nice, well attended, and lots of seating. 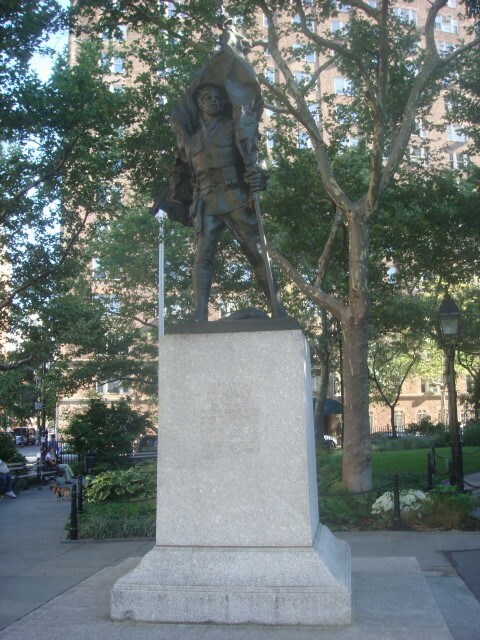 Another thing it has is a statue to local soldiers who fought and died in World War I. It’s not particularly disconcerting, but I always smile about war statues when I’m in Greenwich Village, one of the last enclaves of the counterculture. Or it would be if it hadn’t been thoroughly involved in the real estate runup of the past couple of decades. Expensive homes in the area, don’t-ya-know? Like I said, well-maintained and rather lush with plantlife. Notice the flagpole in the next picture. It has a sign saying it was dedicated in 1933 by the Michael J. Lynch V.F.W. in memory of “our departed comrades.” It’s a nice and useful item in the park. 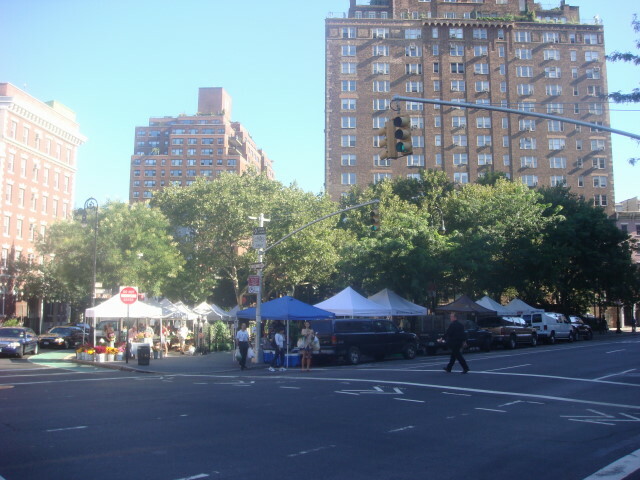 The farmers’ market is not in the square itself. Instead, it surrounds the park by being on the encompassing sidewalk. As such, it isn’t a particularly large market, but it seemed rather popular with the locals that day. This entry was posted on August 13, 2008 at 6:17 pm and is filed under Greenwich Village, Manhattan, Wanderings. You can subscribe via RSS 2.0 feed to this post's comments. You can comment below, or link to this permanent URL from your own site. This is getting a bit more stcejbuive, but I much prefer the Zune Marketplace. The interface is colorful, has more flair, and some cool features like Mixview’ that let you quickly see related albums, songs, or other users related to what you’re listening to. Clicking on one of those will center on that item, and another set of neighbors will come into view, allowing you to navigate around exploring by similar artists, songs, or users. Speaking of users, the Zune Social is also great fun, letting you find others with shared tastes and becoming friends with them. You then can listen to a playlist created based on an amalgamation of what all your friends are listening to, which is also enjoyable. Those concerned with privacy will be relieved to know you can prevent the public from seeing your personal listening habits if you so choose. I just saw your comment on Nicholas Kristof’s “The Opposing Party” NYT op-ed piece and had to check out your blog. You took the words right out of my mouth — especially in pointing out the error of Kristof’s ways in siding with the Republicans on tort reform. I, too, just watched “Hot Coffee,” one of the most eye-opening, view-altering documentaries I’ve seen in a while. If only it would be required viewing for everyone in this country. True, too, your comment about an uneducated/ignorant populace. If people don’t know what the debt ceiling actually is (from what I see around me, few people get it and almost no one in a position to do so is helping to change that), and their only information sources lie to them about what it is and why it is significant, people will gleefully poll (and vote) against their own best interests. In a country that seems to be filled by increasingly ridiculous and foolish citizens, I’m always happy to discover someone who doesn’t view critical thinking as optional. I just saw your comment on Nicholas Kristof’s The Opposing Party NYT op-ed piece and had to check out your blog. You took the words right out of my mouth especially in pointing out the error of Kristof’s ways in siding with the Republicans on tort reform. I, too, just watched Hot Coffee, one of the most eye-opening, view-altering documentaries I’ve seen in a while. If only it would be required viewing for everyone in this country. True, too, your comment about an uneducated/ignorant populace. If people don’t know what the debt ceiling actually is (from what I see around me, few people get it and almost no one in a position to do so is helping to change that), and their only information sources lie to them about what it is and why it is significant, people will gleefully poll (and vote) against their own best interests. In a country that seems to be filled by increasingly ridiculous and foolish citizens, I’m always happy to discover someone who doesn’t view critical thinking as optional.